William George Birch was born and baptised in Frampton in the spring of 1894, the son of George Birch (a labourer) and Susannah née Trigg. Their home was close to the end of Marsh Lane, probably in present-day Tulip Cottage. Bill, as he was known, worked as a farm labourer before the war, and on 9 January 1915 he married Frances Louise Hitchings (the sister of Charles, Ashley, Frederick and Percival) at St Mary's. Their daughter, Mary, was born in the spring of that year and home became one of the cottages at Splatt. Bill enlisted in Lord Kitchener's Army in early September 1914 at Gloucester along with Francis William Aldridge and Frederick Gilbert Alexander Cook.Like 'Pip' Aldridge, Bill was posted to the 9th (Service) Battalion of the Gloucestershire Regiment. They had consecutive service numbers and appear to have seen out the war together along with Ernest Walter Henry Tainton. After training, they landed in France on 20 September 1915 and were redeployed to Salonika two months later, staying in the Balkan theatre until July 1918 when they returned to France. They were part of the final advance into Germany where they occupied the Rhine bridgeheads until February 1919. A fuller account of the actions involving the 9th Battalion is given in Pip Aldridge's biography and also in our book Frampton Remembers World War I. Bill was awarded the 1914-15 Star, British War Medal and Victory Medal and his service is commemorated on the plaque in the village hall. 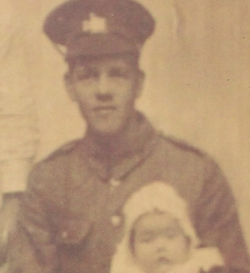 After demobilisation and transfer to the Army Reserve, Bill and Frances had four more children: Frederick, Dorothy, Robert and Stanley. Frances' health was not good and Mary, being five years older than her next sibling, played a large part in bringing them up. Bill was employed as a barge worker for Cadbury's and then as a coal hobbler at Sharpness. On Sunday 20 November 1927 Bill met his brother-in-law, Daniel Tudor, for one drink at the Tudor Arms, Shepherd's Patch, and left mid-evening. It was dark, wet and windy as he cycled home along the towpath and where it narrowed to just three feet (including the grass margins) he either rode or fell into the canal. William George Birch's body was recovered two days later and he was buried in St Mary's churchyard on 25 November. The family remained in the village, later moving to The Green.